Too much focus on the individual issues of personal morality of the Nadja Benaissa case in press reports around the world (822 and counting) and during my three live interviews with BBC World Service radio yesterday (the first of which was also used on the BBC news online website) led me to write this editorial for The Guardian. The trial of No Angels singer, Nadja Benaissa, began yesterday and has already received worldwide media attention. It highlights what experts working in HIV prevention, treatment and care have long argued: that laws and prosecutions as a result of non-disclosure of HIV-positive status are ineffectual, counterproductive and unjust. People with HIV around the world – including Benaissa – are being scapegoated for our collective failure in preventing new HIV infections. 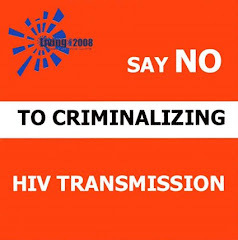 Moreover, it is the stigma surrounding HIV – exacerbated by the media circus that accompanies such trials – that results in far more new infections than the exceedingly rare case of an individual facing the attention of the criminal justice system. Read the rest on The Guardian's website, and please comment there. I'd like to highlight a couple of other positive pieces (hidden amongst the salacious gossip masquerading as court reporting). For those of us who are quick to say: how could she? I would like to ask a few questions: could you imagine finding out you are pregnant, and that you also have HIV, at 17? Can you imagine the fear that you could possibly infect the baby, and the anxiety that the medications you need to take in order to prevent the transmission may harm you and the baby? Can you imagine the fear for your own self of dying a horrible and shameful death? How would you tell your partner, or your ex, or the person you are hoping to have a relationship with? And what could the consequences be? The Times of South Africa highlights that the country's top experts decided against criminal prosecutions for non-disclosure on very good policy grounds. The South African Law Reform Commission investigated the possibility of criminalising HIV exposure or transmission, but came to the conclusion that it would not be the best way to deal with the spread of the virus. According to a report by the Law, Race & Gender Unit and the Gender, Health and Justice Research Unit of the University of Cape Town, a note with the words "HIV positive Aids" was found on the body of a young teacher and wife, Mpho Motloung, 25, who was shot through her head in Meadowlands, Soweto, in August 2000. Also in 2000, Susan Teffo discovered she was HIV positive, and when she disclosed her status to her husband he burned her face over a Primus stove. "These are the cases that have received publicity, and the frightening likelihood is that they represent merely the tip of the iceberg," the unit reported. Finally, Deutsche AIDS Hilfe, which is reporting from the trial (in German only), has produced a new policy statement about HIV and the use of criminal law which can be downloaded in English here. Verdict is due August 26th, according to The Guardian. Am unlikely to write about this case again before that date for reasons that should be clear in the headline of my editorial.